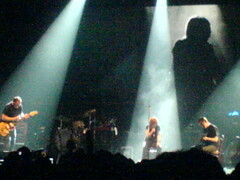 It was yesterday, the second date of the 2008 tour of Portishead and I was there. I had never seen them perform live, so I guess I can say I’ve been waiting… more than 10 years for this! And despite all the anticipation I had built up regarding this concert it still blew my socks off! The new album is very different from anything they’d done in the past and somewhat “weird”, but it does work very well when played live; but the best part, by far, was that they chose to play lots and lots of the old stuff intertwined with the new songs. And everybody there knew those songs and was having an extremely good time! While I can’t say for sure yet (it is still March, after all), I do believe this will be a strong contender for “concert of the year” (on my book, at least). It will undoubtedly make it into the top-5 at the very least. So I have some (god-awful) pictures I took with my cell phone and they’re up at the usual place. Also, if you read Portuguese, there was this guy there with us who also wrote about it on his blog.